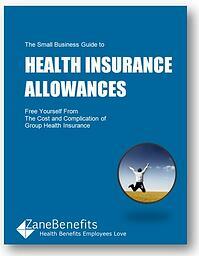 Zane Benefits, the #1 online health benefits solution, announced today the publication of a free eBook "The Small Business Guide to Health Insurance Allowances." The new eBook helps small business owners and HR managers understand how to offer great health benefits without the cost or complication of group health insurance. For businesses to thrive in today’s economy, finding and retaining the best employees is top priority. However, group health insurance is broken. Small businesses need new ways to offer the same (or better) health benefits at a controllable cost. The solution? Health insurance allowances. According to Zane Benefits, businesses are rapidly transitioning to health insurance allowances (aka “pure defined contribution health benefits”) because they offer predictable costs to the business, while giving employees access to quality health insurance. Health insurance allowances reduce the cost and time associated with traditional health insurance, while maintaining all of the benefits employees love. The guide is written for Small Business Owners, CEOs, and HR Managers and provides a framework for offering great health benefits without the cost or complication of group health insurance.